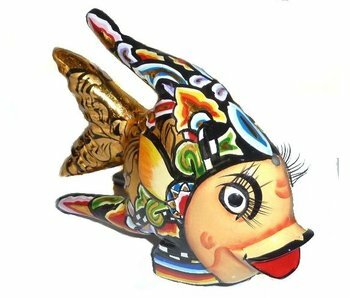 Handmade animal sculptures, with remarkable details such as shoes, jewelry, eyelashes. 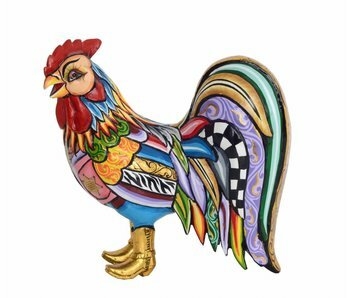 Handmade design rooster Pat, a colorful art-object with golden boots. 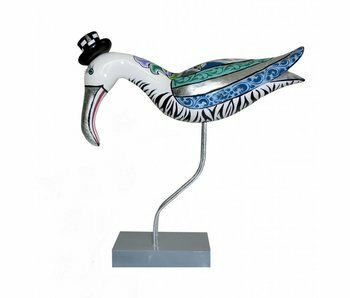 This rooster is part of the animal collection by Toms Drag. Size: 26 x 26 cm. 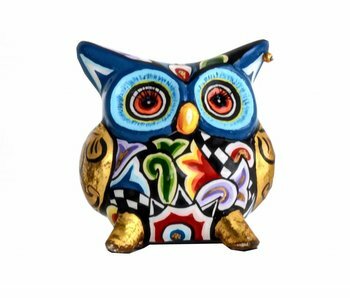 This door stop Owl Hugo is a useful and colorful design accessory. It is easy transportable by the knob. Part of the Toms Drag collection with a height of 70 cm. 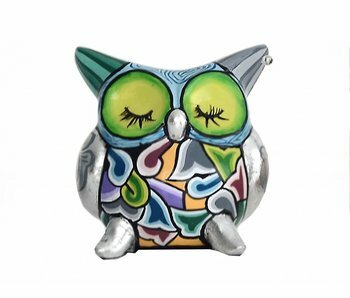 Owl Hugo - XXL. 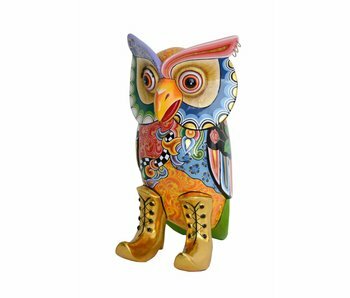 Large, hand-painted owl Hugo in a new design, on golden boots. 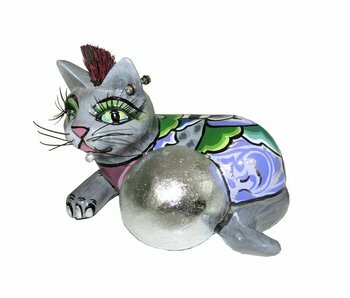 A real Toms Drags art-object. 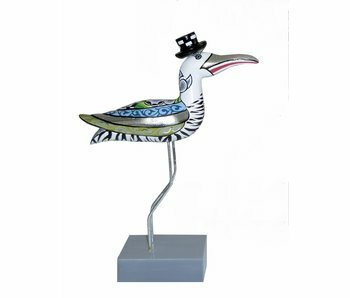 This sculpture has a height of 77 cm x 42 x 40 cm. Monkey Mr.Nilsson, wearing a black hat and golden boots. 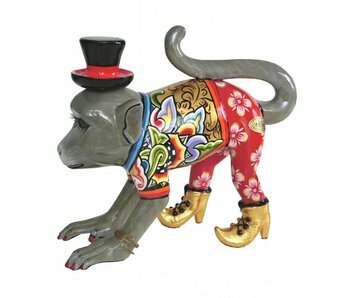 This walking Macaque is made of marmorin and hand painted in Drag style. 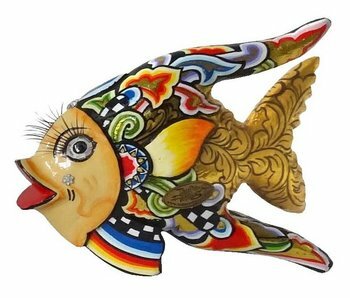 Size L height 26,5 cm, length 23 cm. Monkey Mr. Nilsson, wearing a black hat and red pants. 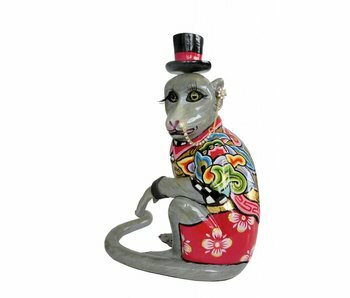 This sitting Macaque is made of marmorin, painted by hand in Drag style. 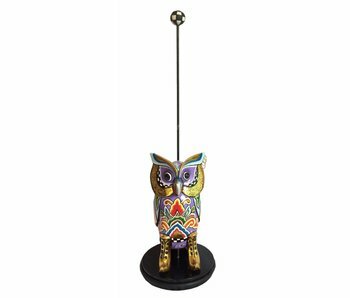 Size S: height 19 cm, length 14 cm. Cheeky monkey Nilsson size L, with black hat, green trousers and earring / nose jewelery. 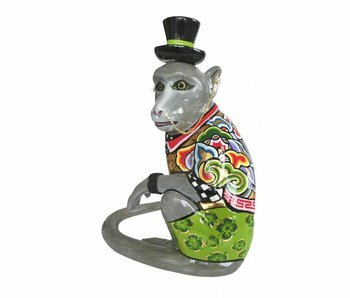 This seated macaque is hand painted in Toms Drag style and made of Marmorin. Height 30 cm. 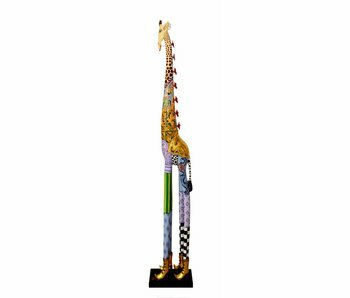 Giraf Roxanna XXL, an animal sculpture, head facing forwards, with a height of 230 cm. Limited edition of 300 units. An eye-catcher for a high room. Transportation and costs outside the Netherlands on request. Giraf Roxanna XXL, an animal sculpture with her head facing down, with a height of 230 cm. Limited edition of 300 units. An eye-catcher for a high room. 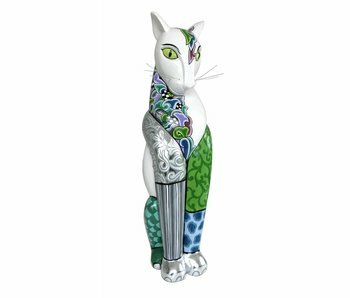 Cat Guardian - m is a majestic white cat with Toms Drag patterns but new fresh colores of the Silver Line like purple, green and blue, combined with black and silver. Height 48 cm. 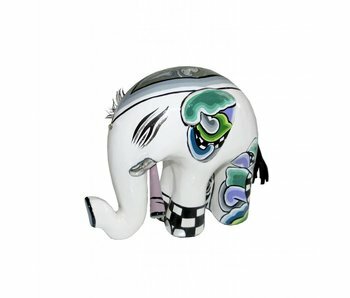 Elephant White Tusker - L, hand painted Toms Drag art-object, part of the Silver Line. Size L 33 x H 32 cm. Made of marmorin. 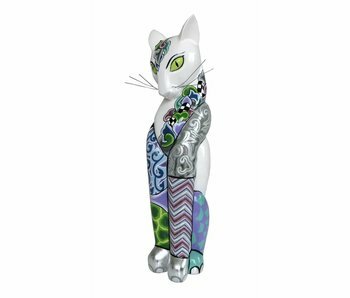 Cat Silver Ball - S is an original Toms Drag figurine with the fresh colors of the Silver Line. 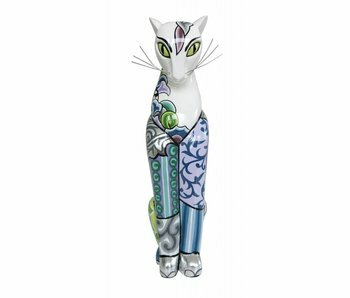 The cat is detailed decorated and painted by hand. Size: 13 x 9 cm. The Animal Collection is a continuation of the "drag" idea of the Premier Edition. The zoo has grown. 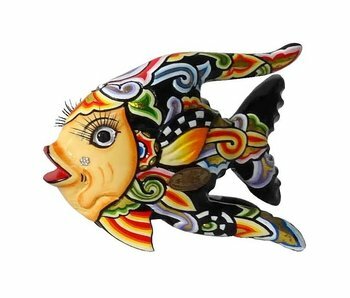 All animals are decorated with fancy costumes and exotic ornaments. They are all the colours of the rainbow, emulating the same cheerful mood as in one of Tom's favourite songs, "What a Wonderful World" by Louis Amstrong. 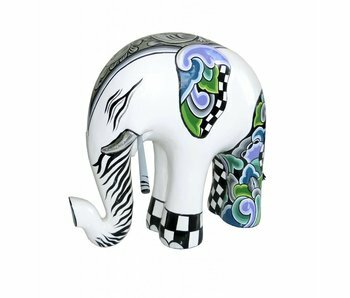 Materials: For his work, Tom uses only best quality materials and paints that meet all European safety standards. 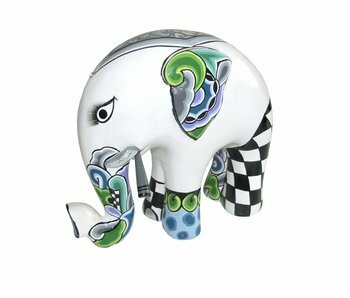 The basic materials used for most of the products of "Tom's Drags" is marmorin, a material created from marble and synthetic resin. 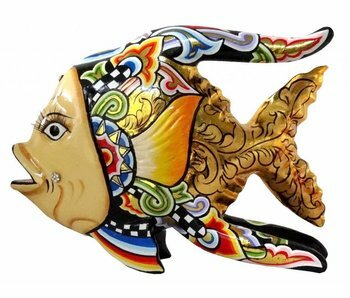 Each single piece of the Tom's Drag Collection is therefore a unique piece of art.